​​Building your dream home is our specialty! Our in house design team works with you throughout your home building process to make your dream of a new home a reality. We are committed to helping you custom design a home that fits your lifestyle and comfort needs, a home that expresses who you are. We will find the perfect home for you. At R & R Dream Homes we have a variety of options available for our homeowners. 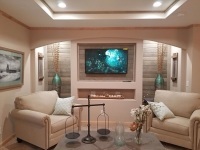 If you are looking to build a single or double-wide manufactured home, custom design a modular home or if you are needing to improve the accessibility in your bath, our design team will provide you with the best options available to meet your needs. With our custom homes you can enjoy modern living features like granite counter tops and packages that include kitchen appliances with your home purchase. At R & R Dream Homes your comfort is our concern, as a dealer with The Onyx Collection & SanSpa Five Star, we offer a variety of bathroom accessories including walk-in tub & showers, along with custom fireplace hearths. We look forward to building you a better home.